Our Rodeo Sheep ride is one of the most hilarious forms of entertainment available and a great variation on the more traditional Rodeo Bull. Guaranteed to have both the rider and spectators laughing out loud. The ride is operated by our trained operator on your behalf and each ride is timed automatically with a trophy being presented for the best time of the event. This game can be operated indoors or out with a free inflatable weather shelter being provided for outdoor events. The rodeo sheep ride requires a flat space of 18x18ft and 9ft overall height clearance indoors or 23x23ft if outdoors and using the weather shelter. For total rodeo entertainment we can also bring along the Rodeo Bull attachment for a small additional cost - the change over only takes a few minutes! 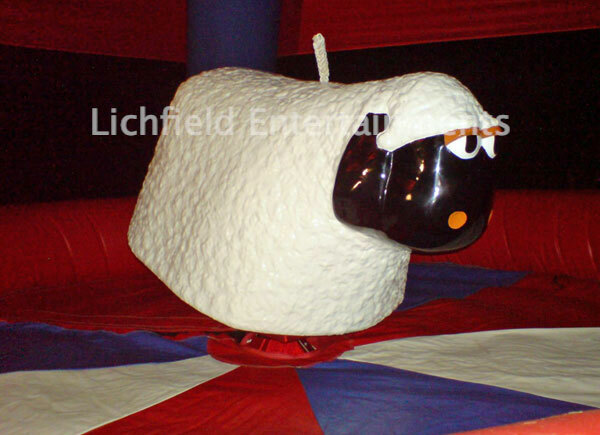 If you have any queries, questions, or would like to hire the bucking sheep ride, please click here to enquire and we will do all we can to help.